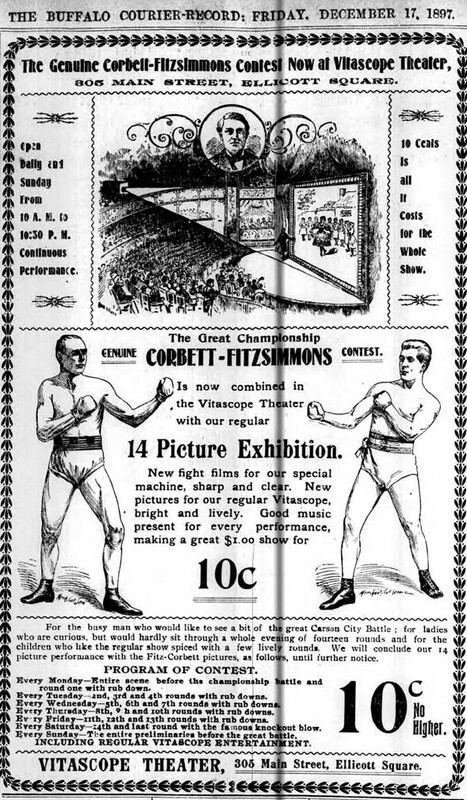 The Mark brothers, Mitchel (obituary) and Moe, surely took note of the excitement over early motion pictures, and soon after they moved their Edisonia Phonograph Parlors to a room in the basement of the new Ellicott Square Building, they added what they called Edison's Vitascope Theater, which they opened to the general public on Monday, 19 October 1896, in collaboration with Rudolph Wagner, who had moved to Buffalo after spending several years working at the Edison laboratories. Terry Ramsaye, in his book, A Million and One Nights [p. 276], notes that this "was one of the earliest permanently located and exclusively motion-picture exhibitions." According to the Buffalo News (Wednesday, 2 November 1932), "There were seats for about 90 (sic?) persons and the admission was three cents. Feeble, flickering films of travel scenes were the usual fare. Occasionally fight pictures were shown." VITASCOPE COMPANY WILL OPEN IT FOR HOURLY EXHIBITIONS TOMORROW FROM 10 A. M. TO 11.30 P.M. There's a theater in Ellicott Square now - a new Bijou theater, beautifully decorated in white and gold, with an inclined floor carpeted in Wilton velvet, nine rows of luxurious orchestra chairs arranged in sets of four on either side of the central aisle-72 in all - a handsome stage with an elaborate proscenium arch, lavishly carved and daintily decorated, rich maroon plush hangings, incandescent electric lights flooding the place with radiance, perfect ventilation and all the other accessories of a delightful place of entertainment. This is Vitascope Hall, the new auditorium fitted up as a suitable place for the proper display of the marvelous possibilities of Edison's wonder worker - the perfected Vitascope. Beginning tomorrow hourly exhibitions will be given in Vitascope Hall, beginning at 10 a. m. and ending at 11.30 p. m., with weekly change of programme. The advertising columns of the papers will tell what to expect. In connection with Vitascope Hall, and serving as a vestibule thereto, is the new Edisonia exhibition quarters at No. 305 Main Street, Ellicott Square. The New-York State Vitascope Company, of which M. H. Mark is general manager, is sponsor for this new place of entertainment. IT WAS OPENED YESTERDAY WITH A PRIVATE VIEW OF SOME INTERESTING SCENES. All the marvels of electricity which are devoted to popular amusement may now be seen at the Edisonia establishment, No. 305 Main Street, in Ellicott Square. They are the phonograph, the vitascope, the kinetoscope and the Roentgen rays. The latest and the most attractive addition to this electrical collection, the vitascope theater, was opened yesterday afternoon with a private and press view. This miniature theater is one of the prettiest places in Buffalo. It is a tiny place, seating only about 75 persons, but is fitted exactly like a large theater, with graded floor, orchestra chairs, handsome decorations and a stage. Those present yesterday afternoon saw several actual scenes portrayed upon the canvas with vivid reality. Among them were those portraying the Garden of the Tuilleries, Paris, the coronation of the Czar, the Dance of the Roses, bonfire in a hay field, street scene in Moscow, view of the Bois de Boulogne, Co.. Waring's White Wings on parade, two negroes in a watermelon-eating contest, corner of 14th Street and Broadway, New-York, serpentine dance and many others. Vitascope Hall will be open to the public daily from 10 a. m. to 11.30 p. m.
It was in 1913 that Mitchell, Moe, and and their partners began to get busy. In January 1913 they planned a vaudeville theater in Manhattan at the corner of Broadway and Forty-Seventh. They hired Thomas Lamb, perhaps the finest of all theater architects (at least in his early years), to design a 2,800-seat playhouse, which opened on Saturday, 11 April 1914 not with a stage show, but strictly with movies. It was called the Strand, and it gave the moving-picture industry a hitherto unforeseen gift. Going to the new Strand Theatre last night was very much like going to a Presidential reception, a first night at the opera or the opening of the horse show. It seemed like everyone in town had simultaneously arrived at the conclusion that a visit to the magnificent new movie playhouse was necessary. I have always tried to keep abreast of the times and be able to look ahead a little way, but I must confess that when I saw the wonderful audience last night in all its costly togs, the one thought that came to my mind was that if anyone had told me two years ago that the time would come when the finest-looking people in town would be going to the biggest and newest theatre on Broadway for the purpose of seeing motion pictures I would have sent them down to visit my friend, Dr. Minas Gregory at Bellevue Hospital. The doctor runs the city's bughouse, you know. For the first time in history, movies were respectable. The industry would never be the same. In architectural terms, the motion picture theater came of age after 1910. Ajello, who had little, if any, experience with this building type, borrowed his imagery from contemporary examples, such as those found in Arthur S. Meloy's Theatres and Motion Picture Houses, published in 1916. Four theaters, all in the neo-classical style, were illustrated: the Loew's National (H. C. Severance, with Neville & Bagge, 1910, demolished) at 149th and Third Avenue in the Bronx, the Regent (1912-13) in Harlem, the Elsmere (Shampan & Shampan, 1914) on Crotona Parkway in the Bronx, and the Eltinge (Thomas Lamb, 1912), a playhouse on West 42nd Street. Though only one was located in Times Square, most theaters in the entertainment district were decorated with classical ornament, including the Lyceum (Herts & Tallant, 1903, a designated New York City Landmark), Maxine Elliot's Theater (Marshall & Fox, 1908, demolished), and the Strand (Thomas Lamb, 1914, demolished). Mitchell Mark, the theater's developer, said he wished to make "the Strand a 'National Institution' which would stand for all time as the model of Moving Picture Palaces." Located at the corner of Broadway and 46th Street, it featured a façade of triple height Corinthian pilasters and an auditorium "topped by a vast cove-lit dome." While in France, Mitchell Mark formed connections with Pathé Freres and brought the first Pathé features to America. At the time, Mark owned a circuit of penny arcades and theaters. Pathé was an extremely important French film production company and distributor that dates back to the beginnings of film. They acquired the Lumière brothers patents and expanded world wide. Their logo, a rooster, became very well known. Pathe opened an important office in Buffalo in about 1918 at 218(?) Franklin Street. The site of the building is now an empty lot. Other distributors had offices along Franklin Street. Many of them are still standing: There are two Warner Brothers Buildings, the Universal International Building, Paramount's offices. Some of the Independent Distributors were in the building still standing at Tupper and Pearl. These included Republic Pictures and perhaps Fox for a time. And to round out the picture, Buffalo was the hub of what were called "film exchanges" for the entire Middle Atlantic Region as far west as Chicago and up to Toronto and other parts of Ontario. This was true well into the 1960's. National Screen Service maintained an important office here until it was shut down in the 1970s. The two buildings occupied by National Screen Service, first, on Pearl, and then on Tupper, are both demolished.